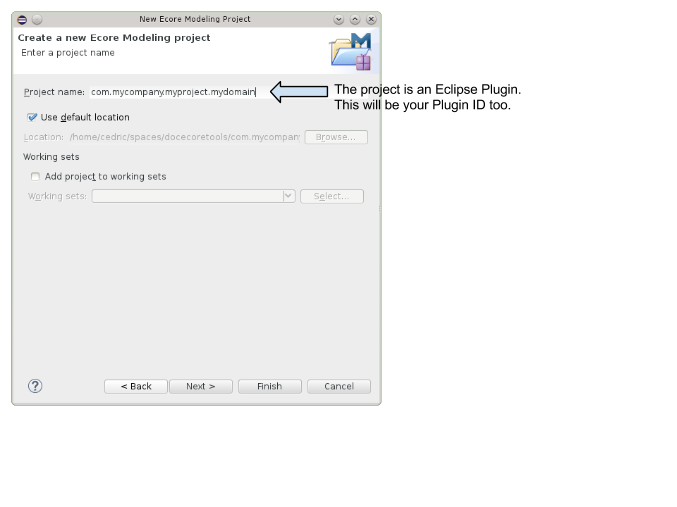 Once EcoreTools is installed in your environment, you can start using it either to create a new Ecore model from scratch or to edit an already existing model. 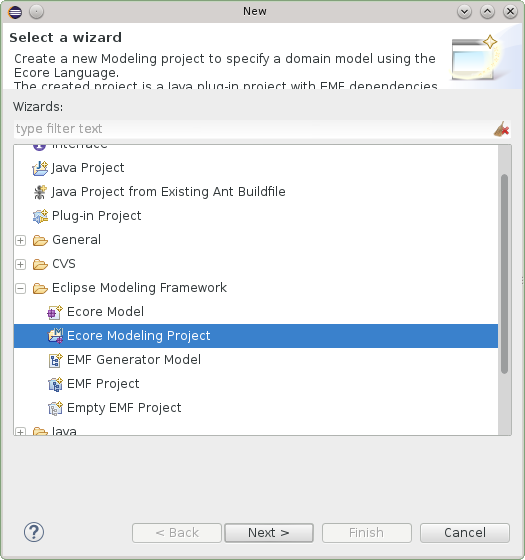 EcoreTools provide a wizard setting up your Ecore project. Click on File->New->Others... and then select Ecore Modeling Project. The next page request a project name. 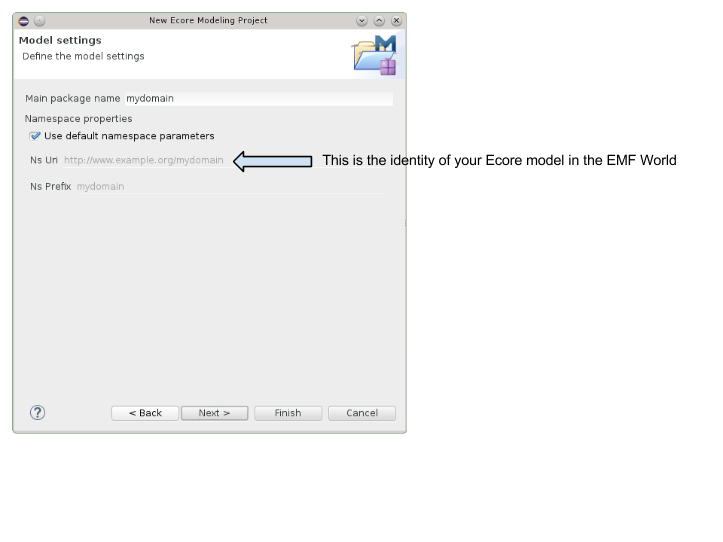 The general convention is to use a java namespace notation for your project name. The project which is going to be created actually is an Eclipse plugin project, the name will be used for the plugin identification. Changing the project name afterward is possible though error-prone and not without impact. Its better to get it right from the beginning. The next page request information about your Ecore model. Here again, you can keep the default nsURI but keep in mind that its going to be the identifier of your domain within the EMF world. Changing it afterward might requires to update several files. The next wizard page request which Viewpoints should be enabled. Viewpoints are a way to adapt the tooling regarding your current activity for instance Designing or Reviewing your Ecore model. Review : for all the tools which are supporting further analysis of your Ecore model. 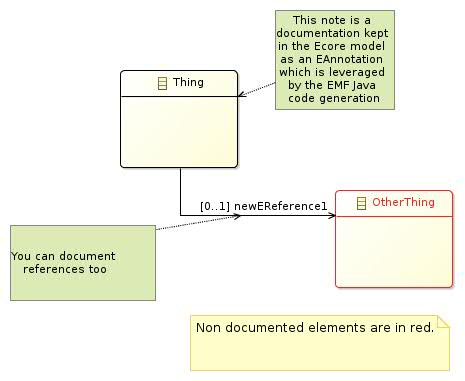 It contributes a new layer on the Entities diagram to display and edit documentation annotations. 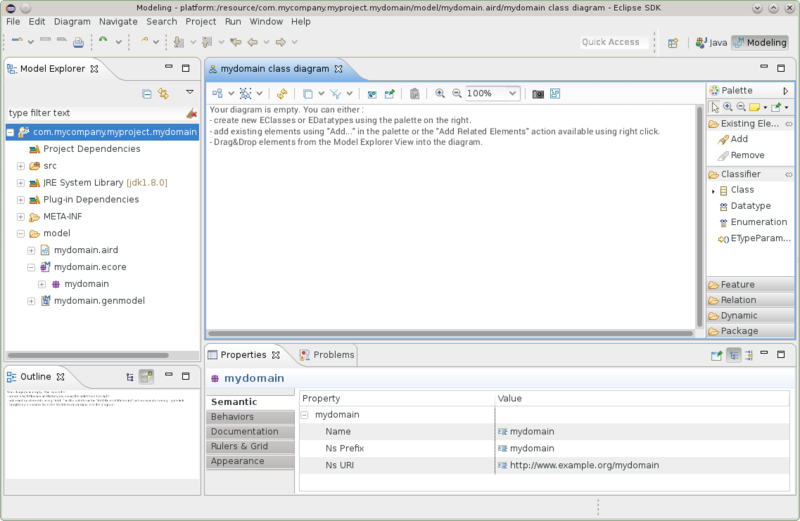 It also provides a table editor to fill the documentation for every model elements and at last but not least it provides a Dependencies diagram you can use to inspect cross EPackage dependencies. Generation : is available if a GenModel is loaded. 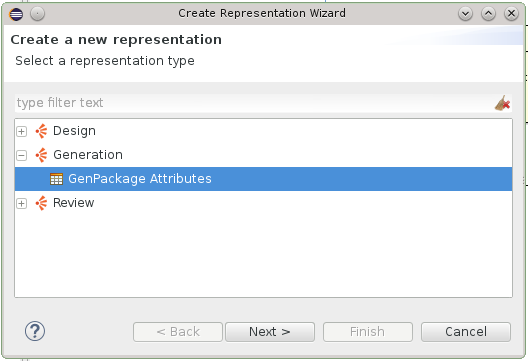 It provides a table editor for GenPackage instances to tweak some attributes which are visible in the generated editor : the property category and the end user documentation. If you are really getting started, Design is a good choice, in case of doubt, select everything. Once you clicked on Finish and the wizard prepared the project, this is what you should have. The Modeling Project is a facility provided by Sirius which handles models within the scope of a project. What does that mean ? Any model which is in the project is going to be loaded by Sirius behind the scene and its elements will be available in your editors. This mode of usage is designed so that you can work with your models easily, but you might want to have more control. 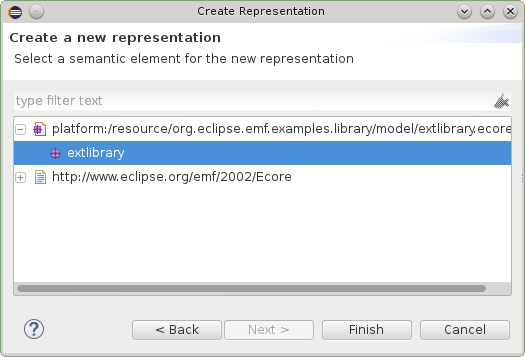 In this case, you can use EcoreTools just by creating Representations Files. Each modeling project has a set of viewpoints which are enabled. 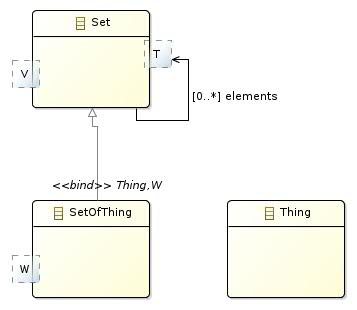 This controls what kind of representations you can create on the Ecore models inside the project. To select which viewpoints are enabled on your project, simply use the Viewpoints Selection action in the context menu of the project itself. A dialog box will open which will show you all the viewpoints which are compatible with your project (depending on the kind of models it contains). You can check or un-check each viewpoint individually to enable or disable it, and click OK to validate your choice. 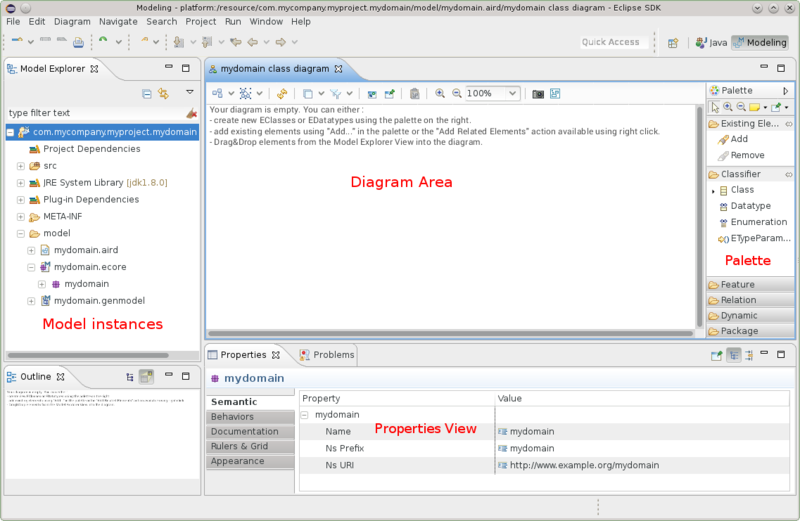 Once the Viewpoints are selected you can create representations : diagrams or tables. All these representations are stored in the .aird file within the project. 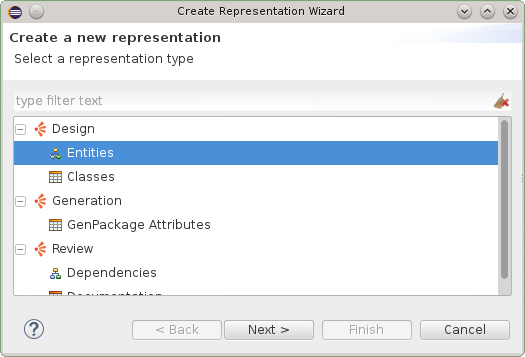 There are several ways to create a representation. You can browse a model in a modeling project and right click on New Representation. And then select the kind of representation you want to create. In this case the tool will guide you to select a model element for which this representation makes sense. this is the main tool to create and edit an Ecore model. this is the main tool to explore and annotate an existing Ecore model. using the Add Related Elements contextual action. 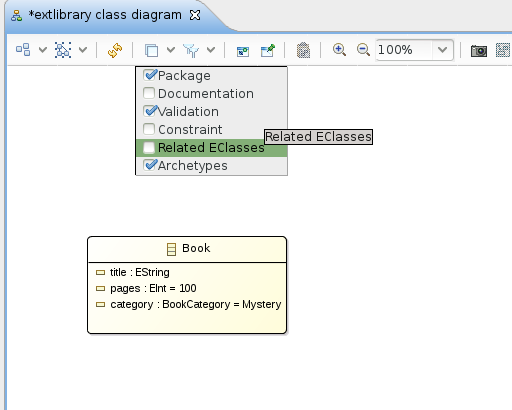 all the EClasses of a given EPackage into a diagram. Hide contextual action or leverage one of the filters to hide, for instance, all the derived references. 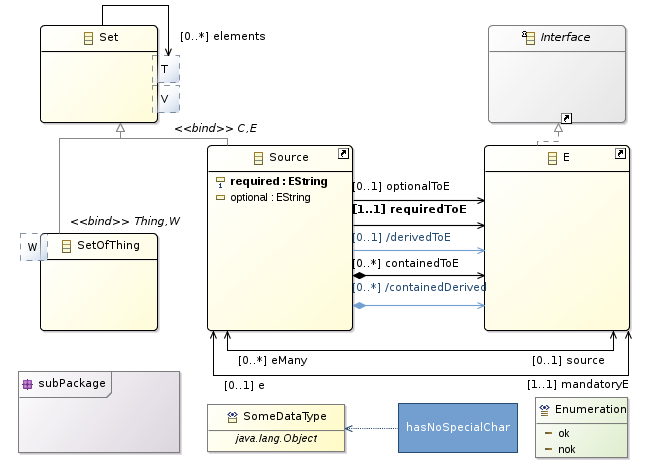 Here is the palette of the Entities diagram editor when both the Design and Review Viewpoints have been enabled. Several layers are provided by the editor. When activating a layer some shapes and colors will changes and specific tools will be available to address your current concern. For example, activating the Documentation layer will transform the shape of all the model elements to add a red border if it is not documented. Two new tools are appearing then in the palette so that you can create the doc annotations. find an element. 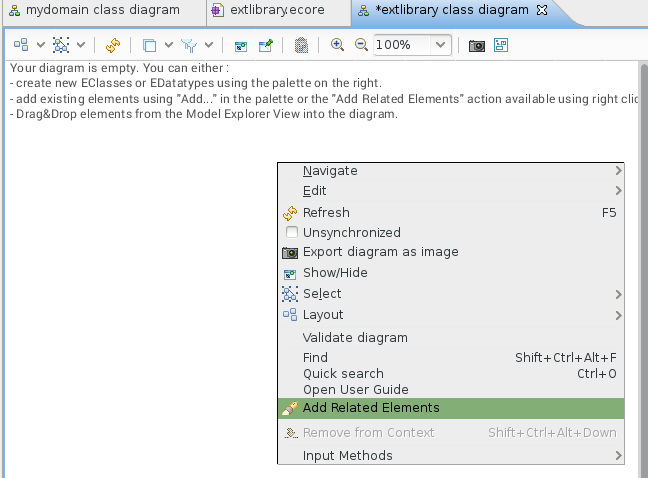 You can select the element in the list and when validating with ENTER the diagram editor will select and reveal this element. a few milliseconds after you select an EClass. Reference will create a non contained EReference with a 0..* cardinality. Bi-directional Reference will create two EReference instances each one being specified as the eOpposite of the other one. Containment will create a containment EReference with a 0..* cardinality. at the source of the EReference will be adapted. 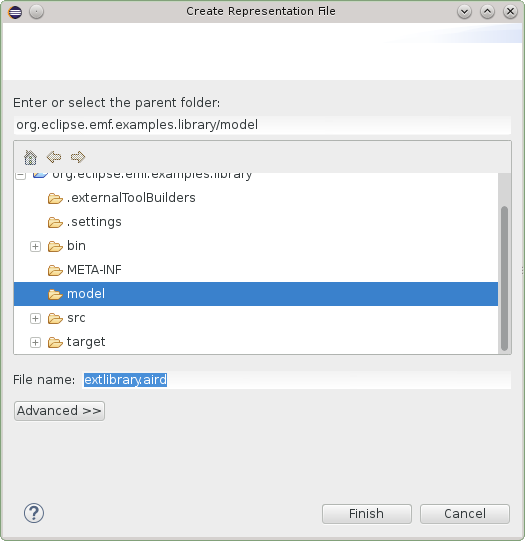 Attribute will create an EAttribute with a default name when used on an EClass. Literal will create an EEnumLiteral with a default name and valud when used on an EEnum. I the case of EAttribute instances, some typing shortcuts are available. See the «Editing Shortcuts» section. 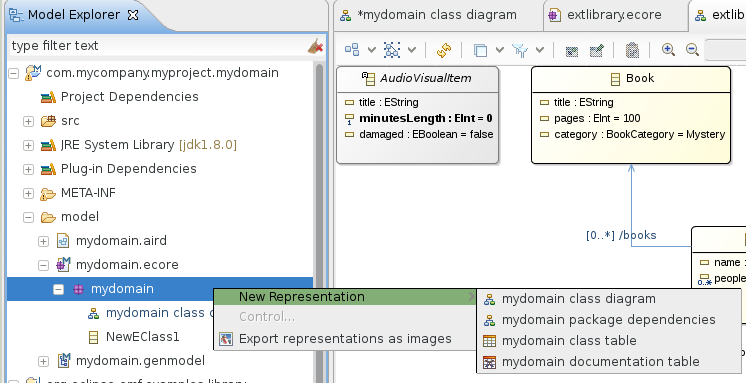 Using the Operation tool from the palette and clicking on an EClass in the diagram you can create a new EOperation instance. You can also directly set the values and create new EParameter instances through the Properties View. contextual action available with a right click. If the layer Validation is enabled, then any invalid element will have red borders. To understand what is the error exactly, just keep your mouse pointer above the element and the tooltip will provide you a textual feedback. typing 1 on an EAttribute or EReference will switch the cardinality to 1..x without updating anything else. typing :SomeTypeName will set the type of an EAttribute without updating the name. typing someName will update the name, keeping the type and cardinality as-is. creating a diagram to document this exploration. 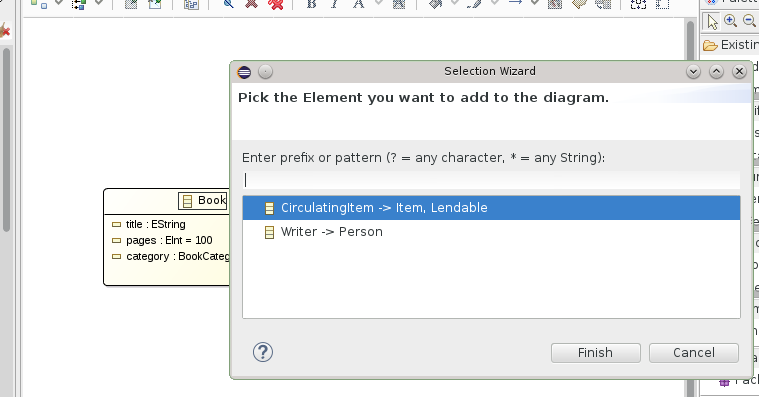 double-click on an element to open a wizard dedicated to the edition of the properties. you can directly use it in EOperation signatures or even create an EReference targeting this parameter. Subclasses will have to specify bounds for this ETypeParameter, either by binding to an ETypeParameter of their own or by specifying another EClass. tools available then in the palette. EMF will detect these annotations and generate dedicated Java methods based on this name, you will have to implement them then. 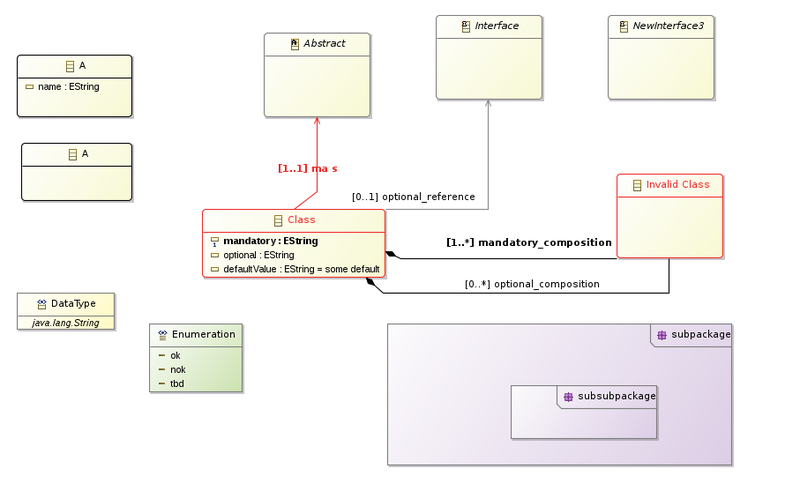 The documentation table displays all the EPackage elements as a hieararchy in the first column and the corresponding documentation annotation in the second one. To edit an existing annotation or to create a new one, select the corresponding cell and type using the keyboard. 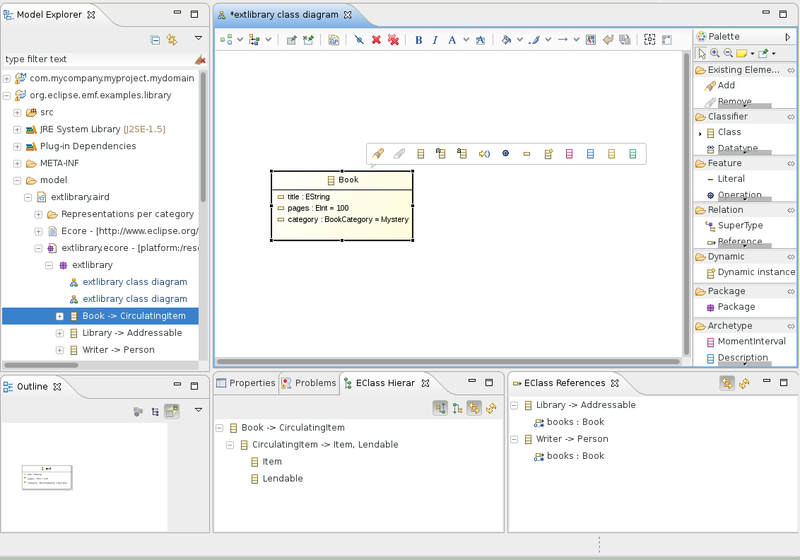 A Depdencies diagram can be created from en EPackage when the Review viewpoint is enabled for your project. 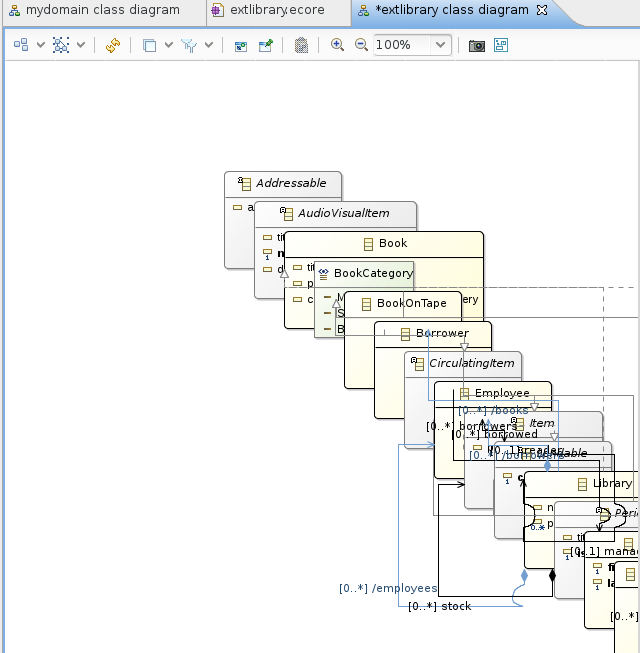 This diagram is helpfull to visualize and analyze the direct dependencies between two EPackage. To leverage it, use the Add... tool from the palette to import the EPackage instances you want to inspect. These instances will be displayed as list containers. are involved in this dependency will automatically be displayed by the tool. Hovering your mouse over such an EClass to have an explanation of the dependency. EcoreTools directly edits the Ecore model in a standard way, no special operation is required to leverage the model itself. You can open a GenModel instance and launch the EMF code generation for instance. 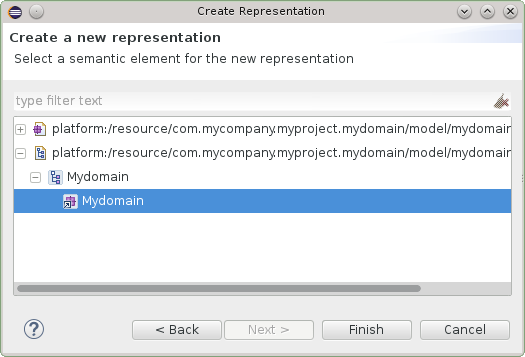 A specific tool in the palette named Dynamic Instance allows you to quickly create an instance of your domain model without requiring any code generation. 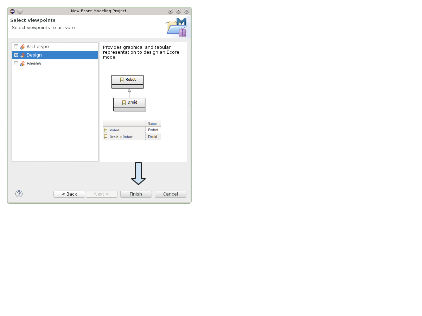 creating this XMI file, once the file is created the EMF Reflective Editor will be opened to edit it. You can export an existing diagram in several format by right-clicking on the diagram itself. 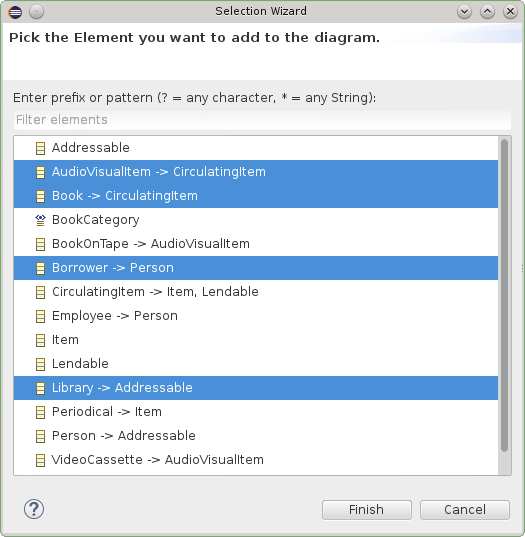 What should I do with my .ecorediag diagrams ? 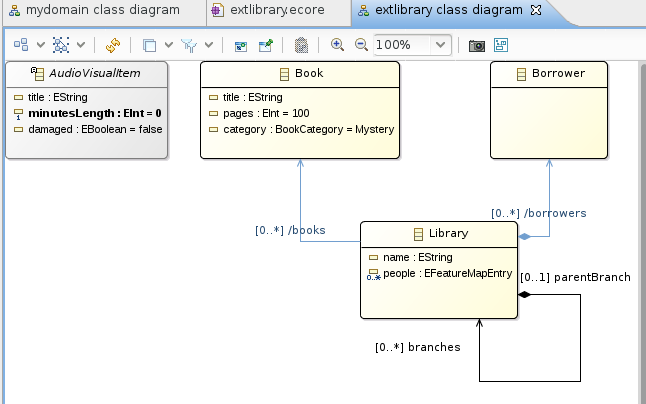 Indeed from version 2.0 EcoreTools moved from GMF Tool to Sirius as a backend technology and that meant adopting the .aird file format for diagrams and other representations. Writing a migration tool from .ecorediag to .aird is possible though we’ve seen that in practice if you have a .ecorediag opened and want to reproduce the corresponding diagram using Sirius 2.0, you can do so quite quickly. As I said, this is technically doable so if you have hundreds of diagrams and want a financial quote related to this work feel free to ask. 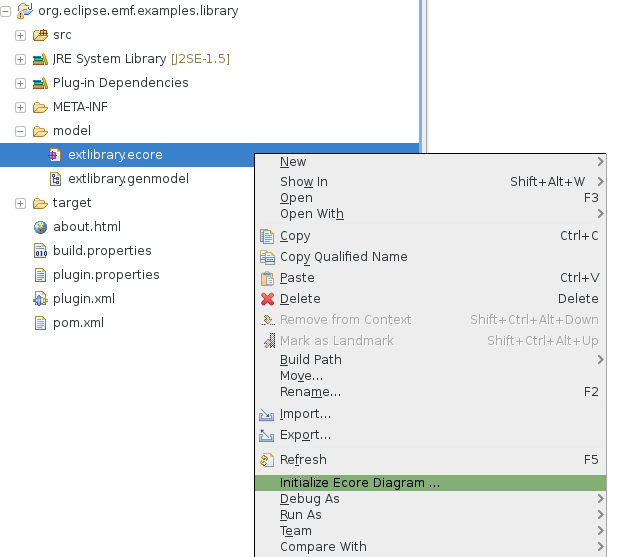 To ease the transition both implementations have been provided with EcoreTools 2.0 but only the Sirius based one has been aggregated in the Eclipse Luna update-site. You can install the legacy editor which supports the .ecorediag format using the EcoreTools update site . This marker is bothering me in the diagram, how can I remove it ? You can remove the validation marker by using the «Problems» view, select the error which bothers you, right-click, and delete. It will disappear from the diagram then. My diagram is getting big, how to find an element ? 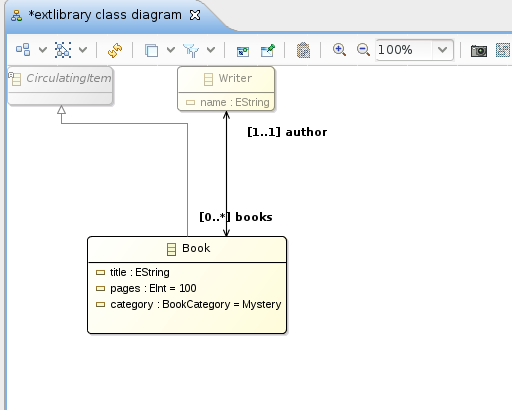 To quickly find something in a diagram just type CTRL+O, type a partial name and select it. The editor will reveal it for you.